Our mission is to galvanize communities to support thriving schools in underserved areas. In doing so, we ensure all children access an inclusive, transformative education. 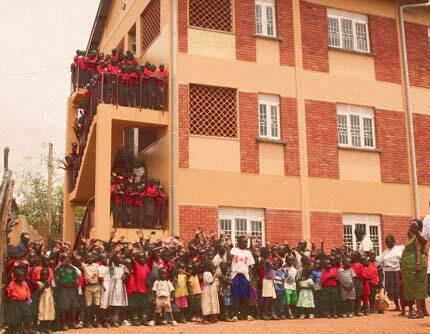 It was near darkness inside the one-room building the students of Meeting Point Kampala called their school. The only light that made it in came courtesy of termites and their appetite for the wooden planks used to board up the school’s walls. Four classes, each with about 125 students, took a corner of the room and seated on the dirt floor, embarked on mastering the day’s lesson. Remarkably, many children were content, focused and enamored with the chance to learn. As we exited the school, one of the school’s leaders mentioned the amount it would take to properly rebuild the structure, negating the need for parents to come board up the walls twice a year to slow the termite damage. I did the math. If I returned to school and asked every student at William & Mary to give $1.81, we could give hundreds of kids the chance to learn in a proper, well-constructed building. $1.81. One dollar and eighty-one cents. Meeting Point Kampala’s new school building opened nearly three years after that visit. Twelve years later, that calculation of obligation and the power of any size a contribution remains at the heart of Building Tomorrow’s work both in the United States and in Uganda.